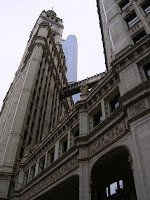 It seems like only yesterday the SO and I were in Chicago.... (The day after Thanksgiving, he surprised me with a weekend of sweetness which included seeing the musical, Wicked). Yesterday was a little different, this time the SO rents (the "in laws") purchased tix through the local travel company and we took a bus tour thing up there. It's always odd to me, why they take the travel company and bus tour up there as we live so close (approx 2 hrs south of Chicago). But I love Chicagoland, and it's something they like to do, so I just go along for the ride. One super thing about taking the bus is the knitting I can accomplish on the ride! BTW: Kate, please note the awesome armwarmers. Just as an FYI, they kept me very warm while out in the very cold Chicago! I was able to make good on my time while sitting with the old people by knitting away at mum's sock. 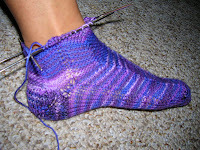 One sock almost done! Kinda interesting, I don't think anyone took a second glance at me knitting, and I didn't notice anyone else knitting. 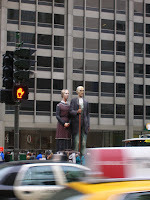 We were deposited along the Magnificent Mile. 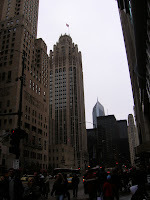 Fun times, but it seems like the SO and I always go up to Chicago and just roam around that one section of the city. Because we were with the tour group (luckily we were not "stuck" with all the the people, we were allowed to "run free" in the city, but had to meet at the pickup spot that evening), we couldn't go too far. We hung out with the rents for a bit, then split up with a promise for a lunch meet up. The SO and I just roamed around on the random streets around the main strip. We found many things that we've never noticed. We found a Trader Shmoes and bought some bread to munch on. We found a small independent bookstore to investigate and patron (yay! rather than the Borders on the mile). I really recommend the shop, it's called After Words Books, located on 23 E. Illinois Street. 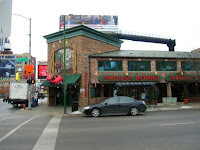 I also found an interesting hot dog place called Portillo's Hotdogs. A chain I had never heard of, but everyone says is great. We'll probably try it out next time we are in Chicago. After meandering around, the SO and I met up with the rents/in laws for lunch. 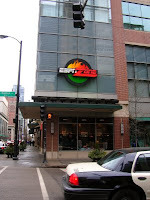 The first time we went up to Chicago for the day of shopping we went to Rosebud on Rush. I will never forget the first time we went to Chicago with the in laws. I think that first trip really shocked the in laws because 1 - they didn't really know me because the SO and I had just started dating, and 2 - I switched up their routine by suggesting a different restaurant. The SO and the fam are very much set on routine and they had always gone to this one other restaurant. For me to suggest another resturant really shook things up. But we all loved Rosebud, and now, three years later, this has become the new routine and this is the resturant we always go to when we go to Chicago with the in-laws. Well, you know how much I love to switch the pattern. After lunch we roamed around some more. Just to embarrass the dude, I took pictures of the buildings (yes I go to Chicago all the time -- but I have never actually taken pictures, I decided today was the day). When is he going to learn that when I find out something I do embarrasses him, I'm just tempted to do it even more? I really love the architecture of the older buildings. I mean there are not too many places in West Lafayette, Indiana that have this sort of craftsmanship (Okay, I just remembered there is a Frank Lloyd Wright House in West Lafayette, I am ashamed to say I have not been to it. 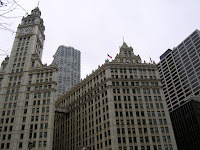 And we have a great school of engineering, I'm sure there are more buildings that deserve recognition, but I mean Chicago architecture is gorgeous.). And finally there was a sighting of the very rare Chicago Moose. I have been whining for a couple years now that I miss seeing moose. They are commonly seen back at home and I love hearing mum say "Suzy, it was a huuuuge mooooose!" But alas, I don't see these impressive beasts in Indiana. But had I known all I needed to do was drive up to Chicagoland to see one, I would have done so much sooner. 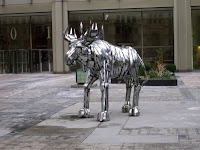 So here, I present the Chicago version of a moose. It is a little different from the ones back at home. 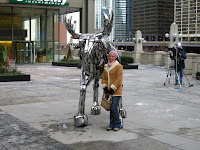 The moose in Chicago are a little smaller, shiny and, well, more docile. I don't think I could have ever gotten this close to one at home. I am so happy to see you found the Lesser Known Skeins. Your blog may be new but it is just the reason I wanted to start this group. She also has a bunny and she is finishing up a pair of Jaywalkers for me! I will visit your blog and comment often.